Audiovisual Digital Surrogates from the Joseph T. Tykociner Papers, contains a digitized film concerning Tykociner's contributions to research and in innovation in sound recording as well as in the field of electrical engineering. The digitized film shows a picture of Tykociner's apparatus and describing of its method of operation. Includes pictures of J. T. Tykociner, Jacob Kunz (developer of the photoelectric cell connected with the new process), Paine reading aloud, and Manoah Leide playing the violin. The film also shows pictures of the soundtrack and how it is affected by sound such as speech, the ringing of a bell, and the violin. This clip was produced from a videotape dub, of a duplicate a film was made in 1954 by the Motion Picture Society of America, in order to match the sounds of Mrs. Tykociner and the violinist. 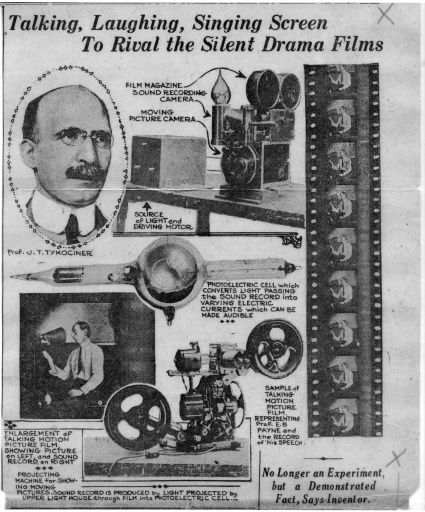 The original demonstration film was produced in 1921-22. Additional material is available upon request, including a digitized audio recording concerning an interview with Professor Tykociner (March 9th 1967), concerning his early interest in the recording of sound and sound in moving picture; his experience as student, research engineer and faculty at the University; research and experiments with sound recording; career as research engineer for Marconi company, for German companies on radio telegraphy, for radio communications at Russian companies and the Army; his return to the US in 1920; his latter demonstration of sound in film; as well as about commercials and films using Tykociner's sound system. Note: The digitized interview recording is currently nearline due to copyright statements, but permissions are to be reevaluated at a later date.